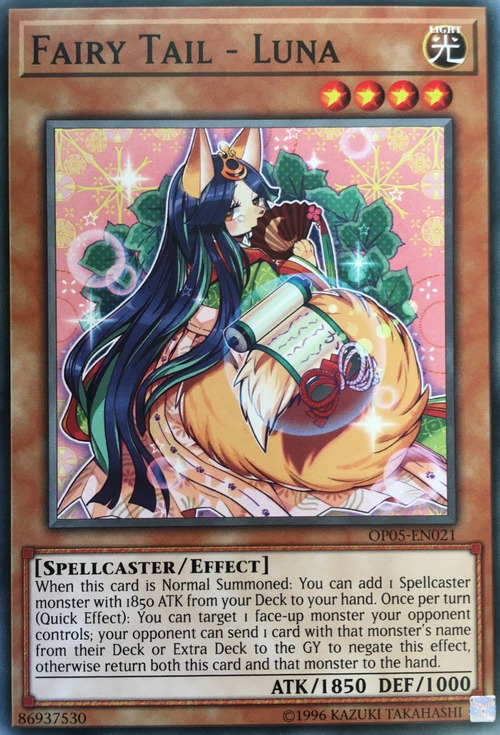 When this card is Normal Summoned: You can add 1 Spellcaster monster with 1850 ATK from your Deck to your hand. Once per turn (Quick Effect): You can target 1 face-up monster your opponent controls; your opponent can send 1 card with that monster's name from their Deck or Extra Deck to the GY to negate this effect, otherwise return both this card and that monster to the hand. This card is based on the Japanese monogatari, The Tale of the Bamboo Cutter. This monogatari is also named The Tale of Princess Kaguya. 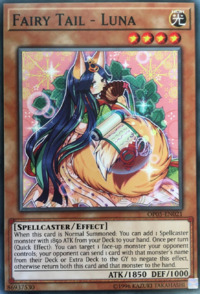 This card's effect reflects part of the plot of the monogatari: Princess Kaguya is visited by 5 princes that ask for her hand in marriage (enemy's monster), of whom she asks to conclude impossible tasks for her to accept their marriage proposal (reflected by sending a monster with the same name from the Main Deck or Extra Deck to negate the effect) but none of them can conclude their tasks (reflected by returning the monster back to the hand if a monster with the same name is not sent to the graveyard). Her also being returned to the hand by her last effect can be a representation of her going back to her people on the Moon. This is the first card among the 'Fairy Tail' monsters to not be related to Grimms' Fairy Tales. Due to her more archaic theme, this monsters has a scroll on its tail, instead of a book like the other 'Fairy Tail' monsters.
" "Once per turn (Quick Effect): You can target 1 face-up monster your opponent controls; your opponent can send 1 card with that monster's name from their Deck or Extra Deck to the GY to negate this effect, otherwise return both this card and that monster to the hand."" is a Quick Effect that can also be activated during the opponent's turns. "(The effect targets 1 face-up monster your opponent controls and it "cannot" be activated during the Damage Step.)"